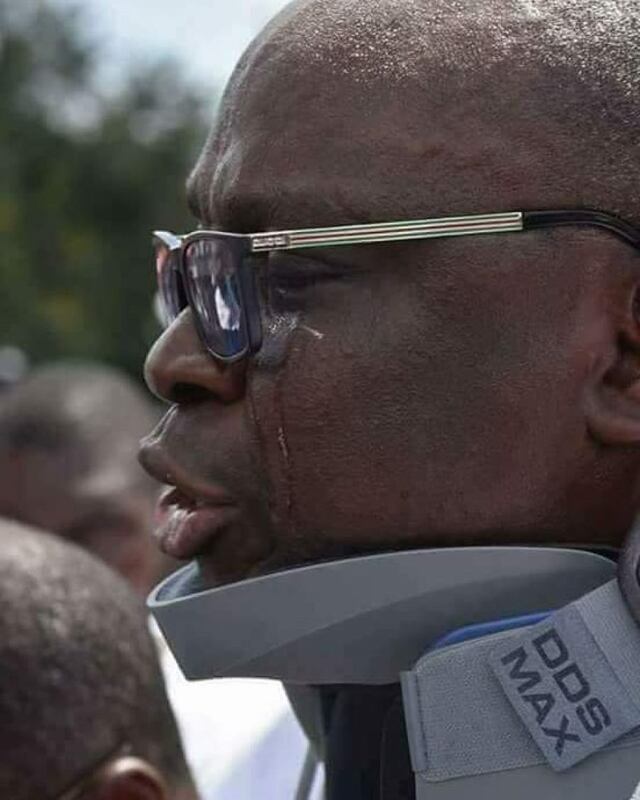 Governor Ayodele Fayose yesterday made his first public appearance, seventy-two hours after the governorship election. Fayose visited the palace of the Ado Ekiti paramount ruler, the Ewi of Ado-Ekiti, Oba Rufus Adeyemo Adejugbe Aladesanmi 111. He narrated how he and his supporters were still being hounded after the election had come and gone. He said: “I have come to officially tell you sir, as the paramount ruler of Ado-Ekiti, the state capital, that the Government House was invaded by the police. Over 400 of our members are being detained as we speak now. “After the poll on Saturday, my wife was prevented from entering the Government House for about 45 minutes. Since last Wednesday, security agents had laid siege to the Government House, and were subjecting people to untold hardship coming in or going out. “The poll has come and gone irrespective of what we went through. The constitution says I am still the governor till October 16 this year. Our state radio and television stations have been shut down. And there has been no means of getting across to our people. Fayose added: “It was only yesterday morning that security agents at the entrance of the Government House were withdrawn. If we have been robbed, I still have a right to life and my family too, has a right to life. The governor told the monarch that the three units of police protecting him had been withdrawn. “All my security men have been withdrawn since last Wednesday, and I am only left with just a few. Harassing me is not in the interest of democracy. “People must intervene before things go out of hand. I don’t know why we should be in this situation in 2018,” he said. The monarch thanked God that nobody died during the poll. He said: “As if we knew, monarchs arranged many meetings before the election and pleaded with everybody that before, during and after the poll, we don’t want any trouble. “We said then that whoever wins, there should be no problem, adding: “The way I see you, I know something is happening, as you rarely wear this type of dress to the palace. He promised to convey his message to the Oloye of Oye-Ekiti, who is the Chairman of the Ekiti State Council of Traditional Rulers, adding that they had been worried about his whereabouts. The monarch appealed to security agencies to restore his security aides as the sitting governor of the state. “As Ekiti leaders, we will intervene. You, Fayemi and Eleka are our sons. Peace must be allowed to reign. We need peace in our state,” he said.